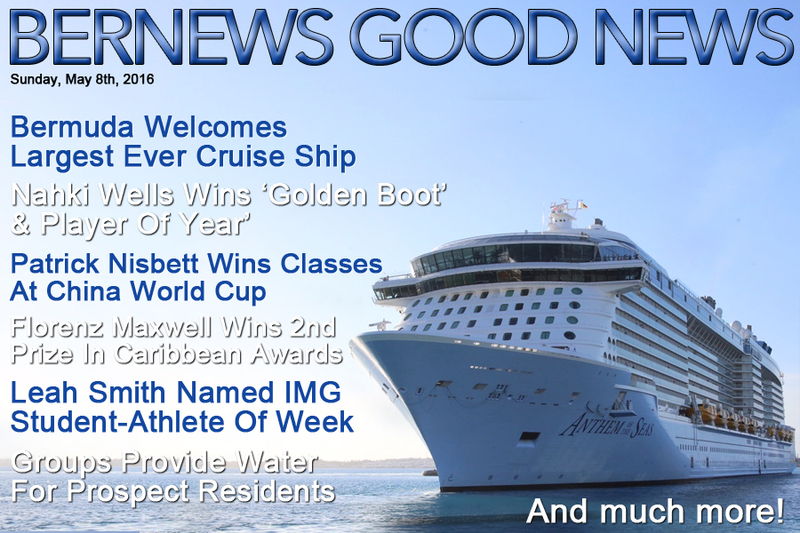 News that Bermuda welcomed its largest ever cruise ship as the Anthem of the Seas paid a visit, Nahki Wells won Huddersfield Town’s ‘Golden Boot’ and ‘Player of the Year’ awards, Bermuda’s Florenz Maxwell won second prize in the Caribbean Literature Awards, and Patrick Nisbett won two classes at the China World Cup were all some of the positive news stories from the past week. Other good news stories included the vessel Phaedo3 smashing the Bermuda to Plymouth sailing record, Bermudian athlete Tyler Butterfield extending his partnership with Mavic, Delray Rawlins being nominated by the England Development Programme, and members of the Alpha Phi Alpha Fraternity, Kappa Alpha Psi Fraternity, Alpha Kappa Alpha Sorority, and Delta Sigma Theta Sorority delivering water to Prospect residents. Additional good news included 53 Bermuda High School students completing the CADA Life Skills Program, the Bermuda Insurance Institute announcing the winners of the 2015 Insurance Industry Awards, and Leah Smith being named the IMG Student-Athlete of the Week. We also posted various community photo galleries, including coverage of the ADHT African World Heritage Day, the first Harbour Nights of the season, the newly-installed bridge at Martello Tower, super-yachts visiting St George’s, the Santo Cristo Dos Milagres Festival, the arrivial of the Anthem Of The Seas, the St. George’s Marine Expo, and karting and equestrian action.